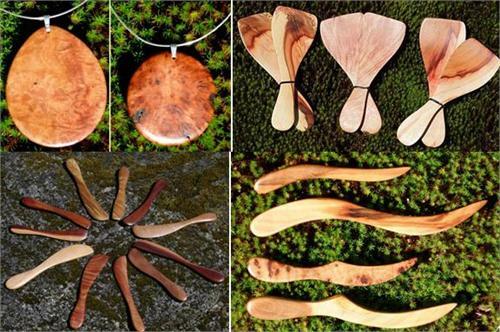 You can rest assured that the wood for my eco friendly gifts comes form the most sustainable of eco friendly practices. The wood comes from blow-downs or dead standing trees and branches. No live trees are cut down for their wood, and I use all parts of the tree or branches and waste nothing, not even the wood scraps or sawdust! 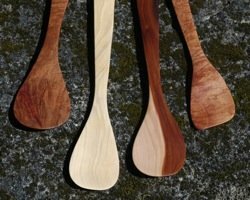 The wood I use to create my earth friendly products and eco friendly gifts comes from Arbutus forest fall downs and dead trees and branches. This allows the natural cycles to take place as much as possible from life to death, allowing healthy Arbutus trees to thrive. Sometimes windfalls happen after a big storm and a healthy tree succumbs. Sometimes an already very dead tree just bites the dust! 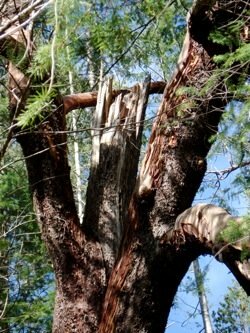 Madrone can die naturally from over crowding, lack of sun because of other trees' blocking their needed sunlight or lack of enough soil or water, and, of course, wind. Growing often on bluffs with shallow soil, at some point their mass becomes so great that a big wind storm will take them down. That's why I can say I use eco friendly wood for my green gifts. I do not cut down live trees. Many healthy looking trees are actually slowly dying from the inside out. In particular, some very big trees can have healthy branches but can be hollow in the main part of the trunk. A huge meter thick Arbutus tree came down in a big storm in stages. I first found a giant branch blown off but the next day after the storm had peaked, I found the whole tree down. You could see about 12" of hollow in the base of the trunk thus weakening the tree, succumbing to the wind! There was a lot of wood in that tree for my eco friendly gifts. Sometimes a tree will slowly die while standing, loosing all its leaves and small branches over time, waiting to fall. Sometimes a branch will die to protect the tree during drought, sacrificing an arm. You can find these if you walk where Madrone trees grow. Once the tree is on the ground it can decompose rather quickly for such a hardwood. I will cut down dead trees (without leaves and life) or branches if the wood is not yet rotten. Arbutus will often regenerate from stumps with new shoots appearing the next season, or if the tree top is blown off it will quickly start re-growing new branches. They are very resilient. 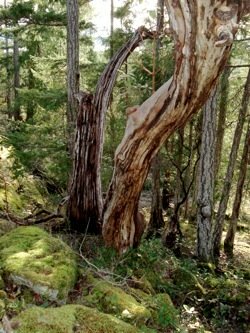 I like dead Arbutus because the wood changes from its natural whitish colour to varying shades of brown. Sometimes too you can find gorgeous spalting on these dead pieces. They make stunning green gifts. Making smaller items as I do into eco friendly gifts and products from Arbutis makes the most sense. The wood cracks and twists a lot as it dries making large straight timbers for eco friendly hardwood flooring a rarity. Once dry though, it is very stable. It has been an unmatched eco friendly wood for my purposes. 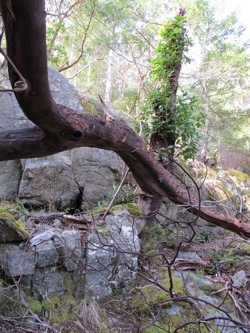 I have been blessed to have discovered the inner beauty of Madrone and enjoy the abundance of trees where I live. I cruise the Arbutus forests and bluffs often and know which trees are dying. I live surrounded by thousands of Madrona trees in all stages of growth and decay. You never know when a tree will come down in a big storm. So now you know why I feel so good about making these green eco friendly gifts! I have more than enough wood from what the forest gives without having to harvest live trees. But wait, there's more to the story! You probably don't realize how much waste is created in making my eco friendly gifts and products. It's a natural part of the woodworking process. Just cutting the logs into firewood size pieces creates sawdust. Then when you make it into lumber from round to rectangular, you leave a good chunk of wood behind. Then any cracked or decayed material has to be removed. Finally you can cut out your pieces leaving discarded shapes behind after cutting out the wood knives or wooden cooking utensils. Of course, if these leftover cutoffs are big enough to make small wooden spoons, I do so. The very smallest pieces that are still good and have a nice grain, I use to make wooden pendants and wood keychains or whale toys as in my wood whale knife. 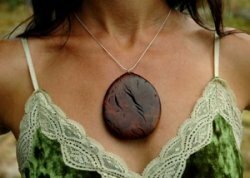 The Arbutus wood pendants make an eco friendly fashion statement as well as being totally unique. I use the best parts of the wood with the rarest of grain shapes and colors, often from the burl wood, to craft them. They make fantastic green wedding gifts. Wood art sculptures and other wood craft art can use up a fair bit of wood because of their shapes. They leave lots of discarded scraps behind. Of course each step along the way makes lots more sawdust. And then the sanding steps remove almost half the wood from the carved product. So lots of waste happens! I use any pieces of unusable leftover wood for the wood stove and, in a good year, half or more of my firewood comes from Madrone wood! The shavings and sawdust are perfect for the compost bin between layers of wet kitchen scraps. 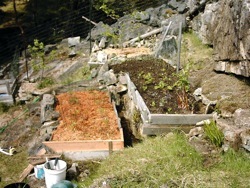 And the garden loves it around my apple tree bases to keep them moist and I use the sawdust for winter soil protection. My rhododendrons just thrive on the shavings! My garden is built right out on the rock bluff. I had to make a lot of soil...I am able to do so from the sawdust. Another use of the shavings is for making paths. The Arbutus sawdust smooths out holes and covers small rocks. Fast and simple. Then I add some wild daffodil bulbs on the side and I have a sweet pathway with flowers in the spring! I never have enough waste left to waste! ...You can't have septic fields out on a rocky bluff so I have a delightful outhouse with fine views and deer to visit. The Arbutus shavings from the chainsaw make great layering material that the worms love, helping to compost the waste in no time flat. And then the apple trees sing my praises! So now you know why I can fully claim that my eco friendly gifts and earth friendly products are green and sustainable!